Home > Advertorials > Premium wines & fine dining is ticking! Are you ready? Premium wines & fine dining is ticking! Are you ready? In its seventh year, Wine Festival and So Chef dinner is calendared for today October 12 and 13, 2018. It will be held on the specious grounds of Avani Lesotho. This fun-filled two days event offers five course meal dinner and roll into the Saturday with premium wine tasting including the local premium Sani wine. The capital will be on fire starting from tonight as revellers roll into Maseru for the annual wine and food tasting. The festival was established to showcase the growing of vineyards and gourmet foods peppering the country. The fun does not stop at tasting; the festival will also include cooking demonstrations by Scott Armstrong and Avani Lesotho’s main chef. Both events hosted at the hotel form the highpoint of the Alliance Franciase and French Institute socio-cultural exchange programme. The two day events also include the exchange of skills and ideas between a Chef cooking French dishes and Basotho Chef at Mo School gourmet of Baking and Catering. The Wine festival will be featuring 32 premium wine makers that will also include the local premium Sani wine. Among others, two premium wine producers from Germany and one from France shall grace the dinner let by the five course meal and followed by the wine festival set for Saturday. pictured: Mothiba Thamae, the SANI producer. Director of the Alliance Francaise de Maseru, Rémi Beghin, said the Alliance Franciase in partnership with the French Institute based in Johannesburg, South Africa, have for the past four years organised these events called the So Chef and the Wine Festival. Beghin said the So Chef is this year featuring Scott Armstrong from Le petit Manoir, Franschhoek in Western Cape and while Paulo De Freitas of Station off-Sales affectionately known as Franks shall be leading the wine festival. Beghin said the event is about bringing a Chef who has worked in France to Lesotho and whom in return shows cases and shares skills with Chefs based in Maseru. He said the 2018 So Chef event and Wine Festival is a bit special as the Chef, Scott Armstrong will is in Lesotho for only two days, while all other years Chefs were brought into the country for a whole week. He said under normal circumstances, the programme would include different workshops in Restaurant and in cooking Schools across Maseru. “For me the most important event we have during this time is the one we have with Mo School of Baking and Catering because it is a cooking school already. “It’s the only cooking school that we have been able to work with so far on this So Chef program. “We have had in the past workshops held at Maseru High School, in Machabeng and other different schools. In restaurants like Café No 7 of Kick 4 Life and others, we have also collaborated. “It is all about sharing skills that the Chef is bringing and for the Chef to learn new skills locally in Lesotho,” said Beghin. Asked why the collaboration on this program So Chef, Beghin said the French Institute and the Alliance Franciase see more to development than just things like health issues. “Obviously it is important to invest in the HIV and IDS programmes, economic development, security issues, but soft social issues, the cultural issues are important for a country to move forward. “So this is what we do when we talk about a cultural issue that is why the French Institute is financing an event like this one. “The more music, restaurants, artists, the more Basotho can express their feelings and ideas about the country and this is how countries move forward,” said Beghin. Beghin said even though issues like health are important, “we do need to get doctors for the sick and cure them but we will not have a happy Lesotho if there is nothing that caters for the social and cultural aspects of life”. He adds that having cultural activities is about bringing people together and making people enjoy life and have fun as well as share experiences. Talking more about the event held at the Mo School of Baking and catering located in Sea Point area, said the program extends a hand to cater for the less fortunate in that it equips them with skills. “Because of the school of Baking and catering they get to learn new skills and make fine food and remake their living. “When talking with Scott about the kinds of recipes they can bring along for the program, I just told him that even though he has worked in France, he is a South African and he knows what can be easily available in the supermarkets and the recipe should be done with ingredients that can be found easily in our supermarkets. “We hope that the women who’d be attending the workshop shall also learn some new skills and use them to cook new dishes for their businesses. It brings a soft issue that is also important,” said Beghin. Talking more about the Wine Festival, Beghin said Alliance Franciase has been organising regular wine testing in its library. It is this wine tasting events that Beghin says are done for exactly the same reasons as the So chef and the workshop for the school of baking and catering. Beghin says the Alliance Franciase chose wine festival because wine is very French and is our national drink. “France is still the biggest exporter of wine and it brings people together. “When you do wine testing you learn about how wine is made and you drink and discuss other issues. “We do this a lot for our regular wine testing gatherings but when he (Paulo) does the Wines festival we work with him also in Promoting the event and in this case sharing the dinner. “”The dinner set for tomorrow (Friday October 12) brings Scott, having worked in France and he is now in South Africa, he is coming Lesotho to Cook hosted by the Chef of Avani Lesotho and they will cook together with the kitchen stuff of Avani Lesotho. “Then the wine will be enjoyed with the food. So it is really a joint operation to have a fine dining experience and also to show that even if we are in Lesotho, we can have fine dining. It is not for everyone, but the more fine dining we can have the more this will trickle down to the rest of the country,” said Beghin. For his part, Armstrong said very glad that he was chosen to visit Lesotho for the So Chef event. “We are here to do the event at Avani Lesotho, which is one of the Dinner for 80 people. The whole idea is to show people how to cook French food and doing so with resources readily available near them as well. “This is to give them the opportunity not only to learn how to cook but also to make money and benefit out of it,” said Armstrong. Furthermore, Armstrong adds that On the workshop is important as we have cultural differences to exchange and as well as teaching people. “It is new to me, so I will also be learning. It is also nice to give back to people,” said Armstrong. On the other hand, Fritas said they have been doing the Wine Festival for seven years now to promote Lesotho by Basotho for Basotho. 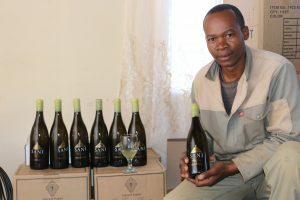 He said the wine festival held in Lesotho brings together boutique wine brands that would only be available in the Central South Africa region and Lesotho at the time of the festival. He said the festival is time for the wine producers to have a conversation with wine lovers and explain in detail the fine work they do to create the masterpiece wines. De Fritas said the wine festival shall also feature premium wines from France with some producer representatives set to grace the event.